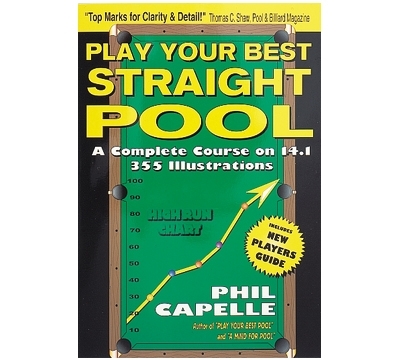 PS40 – Capelle's "Play Your Best Straight Pool"
Play Your Best Straight Pool is one of the most comprehensive courses on the game ever published. This 394-page book provides you with 355 illustrations that make it easy to learn the game's shots and strategies. The book has 72 diagrams on controlling the cue ball and a big chapter on pattern play that shows you how to read the table and plan your runs. To achieve high runs you must be able to play break shot effectively, so Capelle has included 50 illustrations that cover virtually every break shot you'll ever encounter. A special chapter takes you shot-by-shot through a 28-ball run, and chapters on strategy and safety play will help you take control of the table from your opponent. Practice routines isolate specific skills that will help you develop a complete game, you're also provided with a game plan to help you break your all-time high run record.